It’s lawn mowing season, and your mower works hard to keep your grass ship-shape. It’s easy to take this everyday workhorse for granted until something goes wrong, and then a common chore turns into a massive headache. Keep your lawn mower healthy and running smoothly with these springtime maintenance steps! A good spark plug is necessary for your lawn mower to run properly. 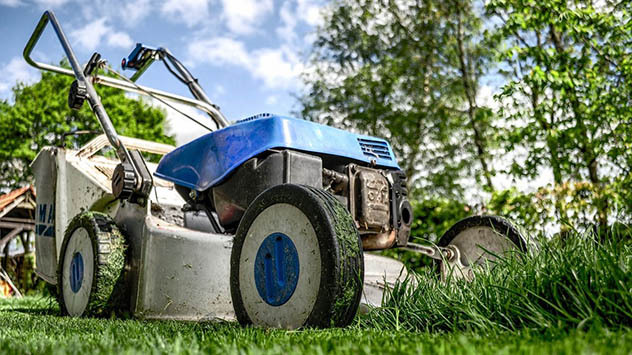 A dirty spark plug, or one that is coming loose, will cause your mower to run choppy, be difficult to start, waste fuel, and “chew” your grass rather than cut it smoothly. A burned-out spark plug means that your mower won’t start at all. Each spring, pull off your mower’s spark plug wire and remove the spark plug with a spark plug wrench or deep socket wrench. If you see dirt or signs of corrosion, spray the plug with brake cleaner, let it sit for a few minutes, and gently brush it clean with a wire brush. After you’ve removed the dirt, buff the plug with a soft cloth. Put the clean, dry plug back in place and hand-tighten it, and put the wire back in place. If your mower won’t start at all or continues to run poorly after you clean the spark plug, the plug may be bad. Replace the plug, checking your owner’s manual first to be sure you buy the right plug for your mower. Because spark plugs are relatively inexpensive, some people choose to simply replace their plugs yearly to save time and effort. *Note: if you find a white, oily substance on your spark plug, your mower may have a fuel leak. Mowers need oil changes just like cars, and spring is the perfect time to take this step. To keep your mower’s engine protected, change the oil at least once a year or after each 50 hours of use. Check your owner’s manual to make sure you get the right type of oil for your mower. Disconnect your mower’s spark plug so it can’t accidentally start. Drain your mower’s oil into an approved container, replace the oil filter if your mower has one, and refill with new oil. Never over-fill; this can damage your mower. Last, reconnect the spark plug wire. Your mower’s air filter can become dirty and clogged, and this will put extra strain on the engine and keep it from running efficiently. Change your lawn mower’s air filter each spring to help it “breathe” easy. First, disconnect the spark plug wire. Remove the filter cover, clean the foam pre-filter, and replace the paper air filter. Replace the filter cover. Finally, reconnect the spark plug wire. Of course, your mower can’t cut your lawn well without a sharp blade. Remove the spark plug wire for safety, and then use a wrench to remove the blade. Many hardware stores will sharpen lawn mower blades for a fee, or you can sharpen the blade yourself. Your mower’s underside, or “deck,” can become clogged with grass and debris that can interfere with its ability to function and lead to corrosion. A dirty mower deck can even become a vector to spread plant diseases around your property. Clean your mower’s deck each spring and midseason to head these problems off at the pass. First, disconnect the spark plug wire for safety. Empty the gas tank, and turn your mower onto its side. Spray the underside thoroughly with a garden hose. Use a brush and soapy water to remove any other dirt and debris. Once the area is dry, coat the underside of your mower with a thin layer of vegetable oil to prevent debris from sticking to it. Follow these steps and keep your mower running like a champ!